"Mayday, Mayday, Mayday Casper 721 is Going Down" the pilot said as he radioed our present position. This was the last radio transmission he was able to give before our UH-1 Huey helicopter crashed in the steep mountainous terrain of the Central Highlands of South Vietnam. It was December 11, 1968. No different from any other day in the jungle, the sun was already blazing down on this morning. It was a hot humid day with sweat dripping off my forehead when we learned all of the details surrounding our mission. Little did I know that I would never forget this day for as long as I live. I was the crew chief of Casper 721. This is my Vietnam War story and my own historic recount of what happened on this day. 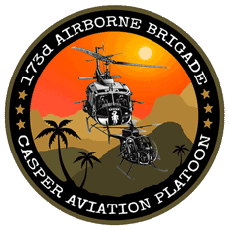 It was December 11, 1968 when Casper 721 was shot down during a command & control mission in the mountainous region of An Khe. Our flight crew that day was the aircraft commander CW2 Walt Henderson, co-pilot 1LT Cliff White, door gunner SP4 John Steen and crew chief SP5 Ned Costa. Our first mission that morning was to insert a 4.2" mortar and team to a mountain top position overlooking the LZ. Next, we flew to LZ Uplift to refuel our aircraft and have two large whip antenna mounted on the skids. We then joined a column of helicopters waiting to lift off when the battalion commander of the 1/503d infantry LTC Frances Percy, acting S3 1LT Jim Taylor, battalion sergeant major, radio operator, artillery liaison and two others hopped into Casper 721. It was approximately 10 am when we lifted off and headed for an area about 20K northeast of the An Khe Pass referred to as Happy Valley. This was the AO (area of operation) where the battalion was being lifted into, and it was our job to fly the battalion commander over the landing zone. We learned decades later that during the S2 briefings the night before, the enemy situation was discussed and included the use of the long-reach guns the NVA had and were using in this area against U.S. aircraft. This information was not discussed with our pilots during their briefing prior to the mission, even after Walt had asked if there were any anti-aircraft guns in the area and was told no. However, our crew was already familiar with this area and had knowledge that Happy Valley was a very dangerous place to fly in. We also knew this area supported a large enemy strong hold that included an NVA infantry regiment. As we approached the LZ, LTC Percy asked us to conduct a fly over so he could see and discuss this operation with his commanders on the ground. Everything went well, then he ordered our pilots to make a second pass over the same area again. Walt was reluctant to do this as we were only flying between 1200 and 1500 feet through the valley. By now, the NVA gunners were probably tracking our every move and just waiting for the right time to fire on us... and they did. It happened when we were nearly through the second pass when I felt a large explosion and the ship started to bounce up and down. Seconds later, Casper 721 was vibrating and shaking violently as we began rolling to the left then started to spin and tumble out of control all while falling downwards towards the trees. I shouting out over the intercom that we were hit and also said God help us! While I could still hear the pilots trying to keep us in the air, I removed my M60 machine gun from the gun mount and tossed it and my ammo box out of the aircraft. I was taught this in training to prevent the gun from caving into my chest during an emergency situation like this. Within seconds, Walt began his series of mayday calls that Casper 721 was going down. After our pilots reported our present position, we crashed into the mountain side. Our ship rolled over on to my left side as it slid very quickly down the mountain side. I will never forget all of the trees, dirt and jungle debris as it moved by my position. This was also the same time when "my life passed before my eyes" and I saw fast moving visions of me growing up with my mom and dad at our home. Next, I saw what I could only explain as a lot of bright white light everywhere. Next, I saw myself standing in front of Jesus. I do not remember any words being said, but the visions from my near death experience have stayed with me since that morning and I can see them as clearly and unchanged now as I did then. After sliding down this 60 degree slope, Casper 721 was stopped by two trees at the edge of a cliff that prevented us from going over the side of the mountain. The landing skids, main rotor blades and tail rotor assembly were ripped off of the aircraft and the tail boom was broken in half and bent towards the bottom of the fuselage as you can see in this Air Force rescue photo. Everyone on board was unconscious. When I came to, I was disorganized and trapped in the left door gunner area of the ship staring down at the ground. I was soaked in jet fuel and could hear the engine still running. All I could think of at that moment was getting out of the wreckage before it caught on fire and/or blow up... but it did not do either. Lucky for us we had just refueled the ship minutes earlier and the fuel tank was nearly full with very little vapors in it that might have caused a fire or an explosion. I managed to free myself and crawl out of the wreckage and could not believe what I saw and moreover, that I survived this ordeal. I did not realize it then, but I had been hit in my right shoulder with what looked like a piece of the carbon steel core of a armored piercing round. I was in a lot of pain and pulled it from my shoulder only to cause more bleeding. I also had a smaller piece of shrapnel in my right leg, along with many cuts and tremendous back pain. I thought my leg was broken, but it wasn't. Next, I quickly started looking for weapons and searched for other survivors at the same time. Cliff White had also freed himself and got out of the ship. I was glad to see him, but saw that he was also badly hurt with injuries to his left knee and right leg. He was also cut up. Cliff and I continued our search and found John Steen still in his seat and trapped by a large broken tree limb pushing on his armor chest plate. He was also hit on his jaw by the grip of his M60 machine gun when it collapsed towards him on impact. John's left leg was badly twisted causing the ligaments to be pulled away from his knee. Cliff and I helped him out of the wreckage. Walt was still unconscious when I got to him. His armor-plated seat had broken from the floor mounts and slammed him forward into the instrument console. I could not see his face and immediately thought he was KIA, but he was still alive. Cliff and I tried to free him, but we could not move his heavy seat off him. Some of our passengers had been thrown from of the ship on impact. All were still alive, some unconscious. Frances Perry was still strapped in his seat and trapped inside the wreckage. From my vantage point it looked like he had injuries to his right arm and shoulder. Jim Taylor was out of the ship laying on the ground with a back injury and some broken bones. We were unclear about the others and their injuries. All of this was happening very quickly. Cliff, John and I got far away from what was left of Casper 721 and took a defensive position behind a group of trees. Between us we had two pistols, one M16 rifle, several frag grenades and some smoke grenades. What we didn't know then was that we crashed practically on top of a NVA regiment and division size hospital that were mostly underground and inside of the mountain near our crash site. 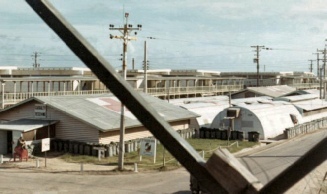 The NVA also had three or four long-reach gun sites within this area with 37mm anti-aircraft guns and .51 caliber machine guns in place. We learned later that it was a 37mm round that took us down. The NVA knew that we were in their backyard and were headed our way to finish the job, but the steep slope and uphill distance between our two positions bought us a little time before they could get to us. It is hard to say exactly how long we were on the ground before help arrived... but it did. As the first UH-1 Huey helicopter came into our area, I remember throwing two smoke grenades to mark our position for the pilot. In fact, so did Cliff and John. 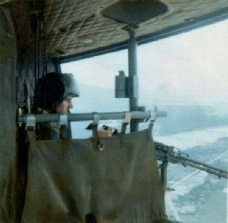 We were not worried about the NVA seeing the smoke, they already knew our position. 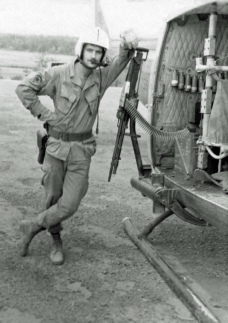 As a Army UH-1 Huey flew above us, they also started to take small arms fire from the advancing NVA soldiers. This forced them to leave us. 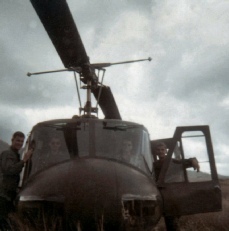 We found out later that was a Casper Platoon Huey 031 with aircraft commander CW2 Larry Kahila at the controls, pilot WO1 Don McKeough, crew chief SP5 Terry Gallagher and SP5 Sal Sosa. An Air Force HH-43 "Pedro" Huskie arrived next, but communist gun fire also forced it to leave us. But before it did, the pilot was able to take the last photo (above) of Casper 721. The NVA was below us on the slope and started to fire at us, but the distance between us was still working to our advantage. Next we heard the familiar whop-whop sound from another Army UH-1 Huey coming to our rescue. This helicopter was from the 189th AHC "Ghostriders" from Pleiku and we were glad to see them. As they hovered over head. Their crew chief was waving at us and pointing to an area on the other side of a near-by bomb crater that they wanted us to go to. Cliff and I headed to the area that was about 50 feet away from our position, but John decided to stay. The Huey was hovering above the tree tops and dropped what looked like seat belts that had been tied together or perhaps it was a longer door gunners monkey strap belt. Cliff had no problem getting across the tree that was laid over the crater and climbed up the strap into the ship. This wasn't as easy for me. I got across the log okay, but the wounds to my right shoulder made it difficult for me to climb up the strap. The crew chief started to help me by pulling on it. As soon as I got my right leg wrapped around the left landing skid, the helicopter started taking AK-47 hits on the tail boom just a few feet away and nearly hitting me. As I was still holding on to the landing skid, the pilots quickly got us out of the area. I turned and looked down to see my ship laying on its left side as I was being pulled inside of the helicopter. I remember looking up at the pilot and thanking him. I also recall the tail number of this Huey on the console... it was 711. 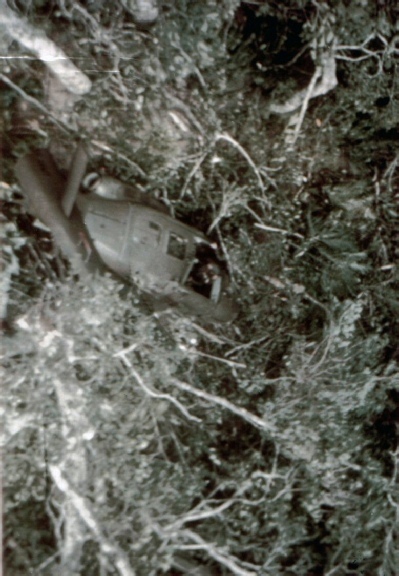 A few minutes later, a UH-1 Huey from the 61st AHC inserted some of the elements of the 1/503d infantry to the crash site who provided security for the remainder of this rescue operation that was about to take place. Walt was still trapped in his seat, John and our seven passengers still needed help. We did not know it then, but it would take the next 7 hours for the Air Force firemen and the brigade flight surgeon to free Walt from the wreckage. In the meantime, Cliff and I were headed to Phu Cat Air Force Base and happy to have been rescued. When we arrived at Phu Cat, Cliff and I were separated. I remember being carried out of the helicopter and placed on a stretcher as a group of Air Force nurses and doctors surrounding me. I suppose I was in shock because one of them held a paper bag over my mouth while I wa s breathing. Another doctor injected a shot of something directly into my shoulder wound. Whatever it was, it was strong and everything started to look distorted to me while the pain disappeared. After they temporarily patched my wounds I was then medivaced by helicopter to the 67th Evac Army Hospital in Qui Nhon. As the Huey landed on the hospital tarmac, the medics took me into the ER. I remember them taking my pistol and knife, removing my boots and cutting away the rest of my clothing. After the x-rays, I was patched up and moved to a hospital ward. I never saw Cliff or Walt in the hospital, but I did see John Steen when he was admitted into the same ward as me. The next day, Brigadier General Richard Allen came to visit us the next day and presented the Purple Heart Medal to John and I at our hospital beds. 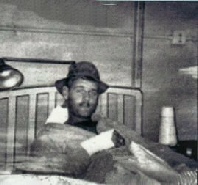 Walt, Cliff and John were later transferred to the Army hospital at Camp Zama, Japan. After a few weeks in the hospital, I returned to Ghost Town in January 1968. The wounds to my right shoulder were healed enough for me to start back to work again... but I was a crew chief without a helicopter! So I was assigned back to performing maintenance jobs on our flight line and filling in as a crew chief when I was needed. It was back at Ghost Town when I learned all of the details surrounding Walt's seven hour rescue. 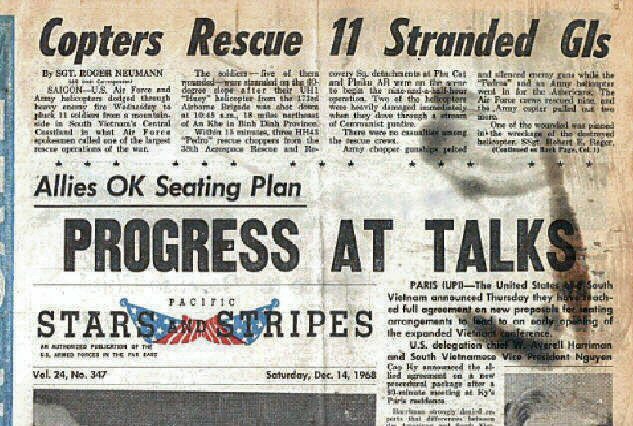 On December 14, 1968, The Stars and Stripes newspaper published a story about our rescue on the front page titled "Copters Rescue 11 Stranded GIs. Beside the details of our mission, the newspaper reported an Air Force spokesmen calling our rescue "One of the largest rescue operations of the war." A Western Union telegram was delivered at about the same time to my mom and dad's home. When my mother answered the door and saw what it was she immediately assumed the worst and started crying and would not open the envelope. When she finally did and read the telegram, it said that I was "wounded in action" when my helicopter was shot down in the Republic of South Vietnam. It explained of my injuries and said I was recovering in an Army hospital in Vietnam. Before I left the hospital, I was able to call my mother from the M.A.R.S. station in Qui Nhon. She was very happy to hear from me during this short five minute phone call. It was 36 years later when I would have the pleasure of seeing all of the Casper 721 crew members back together once again. 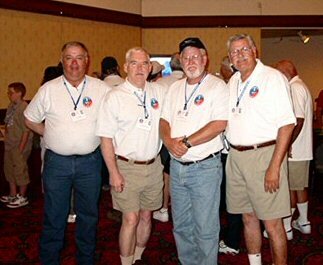 This photos was taken at the 2004 Casper Aviation Platoon Organization reunion that was held at the New Frontier Hotel & Resort in Las Vegas. It wasn’t until 2016 that I received an email from Stu Steinberg, the EOD team leader who told me that they totally destroyed Casper 721 with C4 and Thermite on the day after the crash because of sensitive information that may have been left behind, along with the aircraft’s radio and any guns or ammunition the NVA may discover. The United States Air Force Press Office in Tan Son Nhut, Republic Of Vietnam immediately sent out this New Release telling about our rescue. The Stars & Stripes Newspaper also ran a front page story about our crash and rescue on December 14, 1968, (also seen below).